Every time I look at this picture my heart gets so happy. I am so obsessed with my mom. She is without a doubt my favorite human on earth. I know every kid says "Happy Mother's Day To The Best Mom Ever!!!! ", but seriously guys, my mom is THE BEST MOM EVER! She is one badass, accomplished, fabulous lady. I've never met anyone as hardworking, loving, hilarious, clever, giving, poised, beautiful, and chic as my mother. Hopefully someday I can be half the woman she is! Lord knows I have a long ways to go. But if you're reading this mom, I LOVE YOU and THANK YOU for being my mom! How did I get so lucky?! With Mother's day just two weeks away I've created a gift guide every mom is guaranteed to love (although I'm sure she's going to love her hand drawn card and heartfelt note just as much). Click the pictures below to make mama feel extra special on HER day! 1. If I ever have kids, I imagine myself to be that mom who power walks down the street in heels as she carries one child on her hip and nearly drags the hand of her other child as they rush to little Asher's 4th birthday party, wait no, I mean extravaganza. Duh. In addition to the power heels, I also picture myself having on a pair of the sickest sunglasses, which will let all the other basic moms know that me and my gluten free, non GMO, children are NOT to be messed with. I think these MiuMiu's will do the trick! 2. 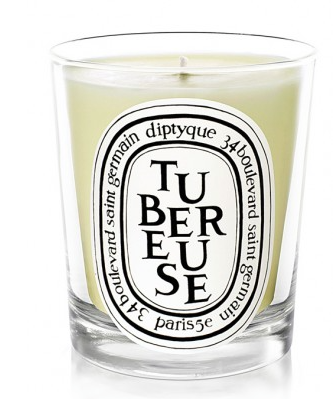 Tubereuse is my FAVORITE Diptique candle. In a perfect world my future home will be lit solely by the gentle glow of Diptique candles. My best friend gave one to me for my 18th birthday and I've somehow managed to make it last all these years. These candles are always a great gift for anyone that appreciates a simple luxury good. Diptique candles can elevate any space, and are the perfect go-to gift for any occasion. 3. I've had my eye on this Dr. Jart Contour Shaper for a while. Even though I'm only 20, and probably don't need to be lifting my face anytime soon, this tool is just so neat! The relaxing massager visibly lifts, sculpts, and contours the face and supports blood circulation, strengthening facial elasticity. 4. Creme de La Mer because it's LA MER. Need I say more? Mom knows. 1. The cutest recipe box ever! I'm not sure if people hand write recipes anymore because, hello, technology, but on the off chance that your mother does scribble her recipes on little cards, this is the perfect box to store them in! And just think how cute it will be when you're a real adult and can actually cook your mother's food. Tradition means something people! 2. A classic throw for your classic mom?! Yes. I think at some point every mom imagines having this famous throw looking all perfect on a living room couch that is not covered in crumbs, stains, and dog hair. I am not a mother by any means, but moms, am I right? 3. Because mom can always use another platter! 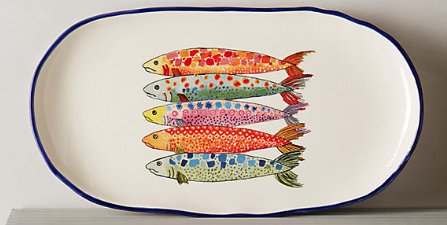 The colorful fish are also a great option for brightening up some kitchen counter space. 4. I love this yellow blouse! It's fun, flow-y, and fresh for summer! It's the perfect statement top mom can throw on with a pair of jeans or white pants for an effortless, sunny glow. 1. Lulu Lemon, aka a mother's uniform. This sports jacket is not only great for outdoor workouts or hikes with friends, but perfect for post gym errands too! Simple and sleek yet flexible enough for busy moms who are just #activeliving #activemom #activelifestyle #healthandwellness #yogabitch. 2. Fitness tracker that looks like jewelry? Honestly, the most perfect invention ever. Because what mom wants to show up to PTA with an ugly fitness tracker chained to her wrist that shouts: HEY CAROL, DO YOU WANT TO KNOW HOW MANY STEPS I'VE TAKEN TODAY? DO YA?! 3. I'm in love with these white Nike's because they are just so darn fresh. Dress them up or dress them down, these shoes will look great with anything and will remain a classic for years to come. Sneakers really are for the active mom who doesn't have time to be bothered by anything less than comfortable footwear. 4. I saw this book in a store once and thought it was pretty. I found it online and I still think it's pretty. Eat Pretty is an informational book full of easy to understand scientific facts that support how beauty starts from within. From healthy recipes to a full lifestyle makeover guide, this book is nothing but magic that will keep mom feeling and looking her best. So there you have it! My very first Mother's Day Gift Guide! Leave a comment below and letting me know if this guide was helpful! I'd also love to hear what special things you guys are planning to give or do for you mother!